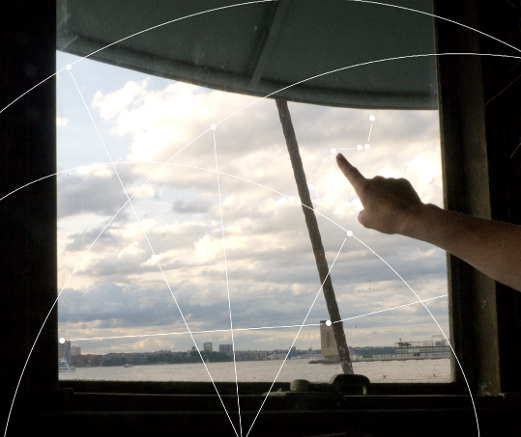 An installation on the windows of the ship's pilothouse maps constellations of navigational aids both visible and invisible in the September sky. Jerinic will be on duty in the pilothouse for informal conversations about navigation and finding paths through unknown seas along unfamiliar lines. This will take place in conjunction with her ongoing installation Leading Lights. Katarina Jerinic’s photography, mixed-media work and participant-based installations respond to and intervene in urban environments in order to draw attention to interactions with surrounding spaces. She received her MFA from the School of Visual Arts and BA from American University in history. Her work has been included in exhibitions at the Bronx Museum of the Arts, Bronx, NY; Queens Museum of Art, Queens, NY; Proteus Gowanus, Brooklyn, NY; NurtureArt, Brooklyn, NY; BRIC House and Rotunda Gallery, Brooklyn, NY; Bronx River Art Center, Bronx, NY; the Conflux Festival, New York, NY; the Center for Book Arts, New York, NY; Gallery Aferro, Newark, NJ; Temple Gallery at Tyler School of Art, Philadelphia, PA, and more. Residencies include MacDowell Colony, Peterborough, NH; the Center for Book Arts, New York, NY; the Experimental Television Center, Owego, NY; and the Bronx Museum of the Arts Artist in the Marketplace program. Jerinic’s collaborative project with Naomi Miller, The Work Office (TWO), has been awarded grants from the Black Rock Arts Foundation, the Brooklyn Arts Council, Chashama, Lower Manhattan Cultural Council Swing Space, and the Times Square Alliance. She lives and works in Brooklyn, NY.